Why put an archival inkjet print into a frame where the image touches the glass or the mount board is acidic? At last somebody is making pre made frames of the same quality as custom made ones, with genuine acid free matt boards and sizes that match Inkjet papers as well as the more traditional sizes. The InkjetPro Classic frames are the perfect companions to the InkjetPro iBlocks one being glass framed and the other frameless. Both are available in a compatible set of colors – Black, White and Walnut Brown. These are high quality framing solutions being made in New Zealand. The InkjetPro Classic frame is 40mm in width with pleasant rounded edges and enough depth to be table top mounted. The sizes of the matt opening and the outer dimensions are both shown. Screw in eyes are provided for wall mounting if required. GMS provides inkjet sizes such as A4 and A3+ with the matts cut to overlap the image edges, thus keeping the print flat. For longer print life a print backing of unprinted archival 100% cotton rag such as Moab's Entrada is recommended as a barrier. See details InkjetPro Classic Black Frame, 40mm wood box frame with matt board. 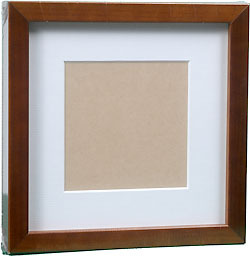 See details InkjetPro Classic Walnut Brown Frame, 40mm wood box frame with matt board. 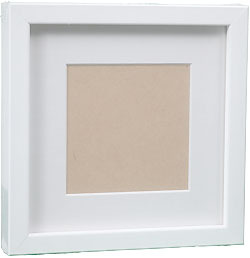 See details InkjetPro Classic White Frame, 40mm wood box frame with matt board.